Another film entry this week, one that’s gone largely unseen for years now but has remained significant nonetheless. 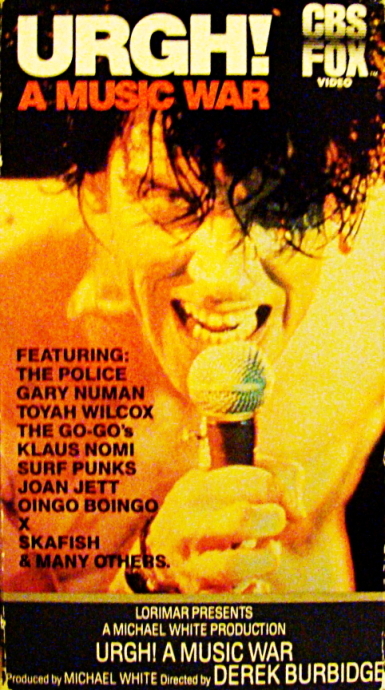 Filmed at various concerts and locations throughout 1980, this British-made film collected many of the biggest names of the early post-punk era together and presented them all in one shot. Comprised primarily of live footage, and edited together so as to form one continual concert, the film displayed an array of sounds, which at the time were all simply regarded as new wave. It contains some iconic images, and a number of excellent performances, but unfortunately still remains sort of a lost artifact. This was no small-time film, it must be kept in mind. It was backed by label money, professionally shot and produced, and yet somewhere along the line since it seems to have been left behind. It enjoyed brief theatrical releases at the time of its debut in 1981-2, but the film owes its longevity to VHS release and a soundtrack album, along with television screenings over the years. For whatever reason – legal/licencing issues are likely a culprit, but some also assume lack of interest in relation to costs – the film still remains without a proper DVD release. Basic burned and digital copies are available upon-request through the Warner digital archive (shipping to US destinations only), but the film remains otherwise commercially unavailable, unless you’re willing to pay ridiculous prices for an old VHS copy on auction. Most of the film is, however, available on Youtube, and that has enabled a new generation of interested fans to see the now long-out-of-print document. And while it is great that much of the footage exists in an easily-accessible spot, there is something important to be said about the film as a totality. In this day and age, when it is easy to overlook the fact that all these bands were part of the same happening, Urgh! A Music War presents a vital connection. It is a document of the early-post punk times, just as things were really kicking into gear, certainly, but, to contemporary viewers, it is documentation that during those times the scene was different than it’s envisioned nowadays. Sure, the groups didn’t actually play together here, but the fact they’re all included speaks to the fact that before all the genre terminology came along, these groups were just the new music, a compelling expression of a new mood in pop. In the end, it’s just a great concert film. The performances are dynamic, they look and sound great (apart from the corny crowd noises added in at certain points), and much of the footage is quality, exciting documentation of the time, like Sting wearing a Beat t-shirt, or Klaus Nomi in that weird plastic tuxedo thing, Devo’s co-ordinated moves, one of the members of Steel Pulse wobbling about in a kkk robe, the young Bunnymen, Joan Jett’s low-slung guitar sneer, and footage of XTC killing onstage a couple years before they stopped playing live altogether. yep great film. if ya wanna yuck it up feel free to join my discussion group on the film. I actually like the warner release. It’s the best thing to come along so far. Sure I would want a real dvd with extras but I can see why they wouldnt sink that kinda money into it.